Reference number for this case: 23-sep-54-Jou. Thank you for including this reference number in any correspondence with me regarding this case. [Ref. vm1:] NEWSPAPER "VAR-MATIN REPUBLIQUE:"
Bourges, September 27. -- Mr. Robert Patient, 35 years old, assistant inspector of the postal and telecommunications authorities, resident of Bourges, who, Thursday evening went by car in Vasselay, in company of his wife and of his children, aged 10 and 11, states to have seen, that night there, in the hamlet of Jou, in the north of Bourges, a weird object of an extreme brilliance, which seemed to go down in a field. At the apparent spot of the supposed landing, a reddish reflection appeared. An incandescent filament long of 50 meters approximately, was in the center of the object, hemispherical, which diameter approached about fifteen meters. During 20 to 30 seconds, it was the darkness. Suddenly, there was a new gleam above the horizon. Mr. Patient, who had stopped his car, started again followed silently during a few hundreds of meters by the object which then disappeared. Other witnesses of Bourges, St Dolchand [sic] and Vierzon claimed to have seen, at concordant hours, a luminous object. [Ref. qh1:] NEWSPAPER "LE QUOTIDIEN DE LA HAUTE LOIRE:"
Visitors of another world landed on Friday September 24, at 10:00 in the morning in a point located in the mounts of Gardunha, at the spanish-portuguese border: This is what reported a Portuguese peasant to the newspaper Diaro de Lisboa, who, with three others of his comrades, worked in the area. A sphere appeared in the sky, in the east, claims the witness. It flew at an incredible speed and launched multicoloured flashes. It landed without noise at with 200 meters of us and two tall figures of approximately 2,50 meters went out of there. They looked like aluminium men. These visitors initially collected grasse and collected stones which they deposited in one limps of a plugging glare. Then, when they saw us, they came to us and emitted some sounds. Face with our incomprehension, they invited us by gestures to go up in their machine. On our refusal, they went up in the craft which took off vertically and disappeared towards the south as quickly as it had arrived. The witness specified that only the "poles" of the sphere rotated and that the equatorial part was transparent and let see moving shades inside. Mr. Robert Patient, 35, assistant inspector of the P.T.T. [State post and phone company], resident of Bourges, which, Thursday evening, was driving to Fasselay with his wife and children of eleven and ten years, stated to have seen this night, in the hamlet of Jou, in the north of Bourges, an extremely brilliant object, seeming to go down in a field. At the point of the supposed landing, an reddish reflection appeared. An incandescent filament of a fifty meters length approximately was in the center of the hemispherical object, whose diameter approached approximately fifteen meters. During twenty to thirty seconds, it was all dark. Suddenly, there was a new gleam above the horizon. Mr. Patient, who had stopped his car, started it again, followed silently during a few hundreds meters by the object which then disappeared. Other witnesses of Bourges, Saint-Dolchard and Vierzon claim to have seen a luminous object at concordant hours. Below is a damaged part of the article transcripted above. Science fiction writer and pioneer of ufology in France Jimmy Guieu reports that on September 22, 1954, during the night, an assistant of the P.T.T., the french postal services, named Robert P., went to Vasselay by car in the company of his wife and his children. At the hamlet of Jou, which is in the north of the town of Bourges, he saw "a strange craft, extremely shiny" which seemed to go down towards a field. At the supposed place where this machine would have landed, a reddish glow appeared. Progressively, the witnesses saw the shape of a hemispherical machine of about fifteen meters in diameter, with a kind of incandescent filament a 50 meters length which was stretched above a cupola on the machine. The craft, that Jimmy Guieu designates as a spacecraft, abruptly ceased irradiating the red gleam, and the darkness reigned during 20 to 30 seconds. After what, suddenly, the machine became luminous again. Mr. Robert P, who had stopped his car, then restarted it. He was then followed on a hundred meters by the machine which had just taken off. The machine moved away then while taking altitude. Aimé Michel reports that on September 23, 1954, at 09:00 p.m., close to Bourges, Robert Patient, inspector of the post offices, his wife and their two children, livin 32 Diderot street in Bourges, were in their car on the secondary road 58 to go to Vasselay, 7 kilometers in the north of Bourges. They had been driving for a few minutes when Mrs. Patient pointed out that there were odd gleams similar to magnesium flashes in the sky, whose source was not visible. But they did not care too much for this. "Precisely because of the sharp light that it released, it was impossible for us to define the form and the size of it. It moved by jolts, died out sometimes in a point, to re-ignite a little away two or three seconds afterwards." "Suddenly, it dove towards the ground and disappeared in our eyes as if it had landed, and at once, at the supposed point, a vast and hemispherical reddish luminosity took off, covering a surface on the ground of which I am tempted to evaluate the diameter as about fifteen meters, insofar as my subjective appreciation of the distance can be correct. Perhaps in the center of this luminous hemisphere, a long incandescent filament spouts out towards the sky, with the same reserve, of about fifty meters. The display lasted twenty to thirty seconds, then all died out. One moment later, the ball seen first of all re-ignited, and we could see that it was in the air again the air, because it was above the horizon." "We had pulled up on the side of the road since the beginning of the phenomenon. The night was dark, without moon, with a half covered a sky, and a rather low cloud ceiling. When it was lit, the object spread more light than the moon, illuminating the countryside and the ceiling of the clouds. It was always above Jou, having resumed its first position and its first manoeuvers, and we had looked at it for a few minutes after its "landing", when we suddenly had the impression that it approached us full speed. We saw it indeed growing bigger very quickly, while its luminosity increased and the shades projected on the ground moved and became divergent. I acknowledge that we were not very reassured. Whereas it was within perhaps two hundred meters, we went up in the car in a hurry and I started without waiting more towards the hamlet close to Fonland, where we have parents. While we drove, my wife could see it through the trees of the forest of Villaines: it seemed to follow us, and that lasted several hundreds of meters. When we arrived at Fonland, it was still visible. But, in one minute, it faded and we did not see anything anymore. It was approximately 09:20 p.m."
Arrived, very moved, at their parents' in Fonland, they told what they saw. When the Patient family drove again on the road at approximately 10 p.m., they went on main road 144 this time, and whereas they still commented on with animation what they had already seen, they passed by again near Jou, and whereas they looked at the sky at the place where they had seen the things one hour before, another object suddenly appeared and crossed the distance in a few seconds parallel to the horizon. They thought that it was another object because this time it had a flat and elongated shape, and the reddish color was not dazzling any more. Aimé Michel notes that for this observation, he selected the report by the Patient family because it was the more detailed; however railwaymen of Asnières between Jou and Bourges, and an employee of the post offices, and other witnesses of Bourges and Saint-Doulchard, one kilometer in the north of Bourges, also saw sharp moving gleams in the area of Jou. Among all these witnesses, the closeest to the phenomenon were the Patients, but the others confirmed that in the area where the Patients drove and at the time they said, odd luminosities seemed to spout out from the ground or from apoint located too low to be seen directly, which can be due to the presence of the forest of Villaines. Michel Carrouges, making some sorting in the French observations of 1954, notes that this observation was made with a distance witness-object of more than 200 meters. The author indicates that on September 23, 1954 close to a place named Jou in the north to Bourges, the Patient family sees a brilliant object emitting a light similar to that of magnesium. When it is on the ground, it emits a red gleam and a narrow ray of light. One moment later, it flies away again, becomes shiny again, moves towards the witnesses and follows their car until they reach the village of Fontland. Vallée notes that independent observations were made by the police force of Plombières and several other people. The object flew in an erratic way during one hour. Sep. 23, 1954, 09:00 P.M., Le Jou (France). The Patient family witnessed the landing of a bright object giving off a magnesiumlike light, a red glow, and a narrow beam of light. It took off again a moment later and followed their car until they reached Fontland. Policemen in Plombieres and several independent witnesses observed the object as it flew erratically over the area for 60 min. (Le Figaro 27 sept. 1954; Paris-Presse, La Croix, 28 sept. 1954) (13; M 69). "Because of the sharp light that it released, it was impossible for us to define its shape and size. It was certain that it was not a large star. The object moved while wavering slightly, died out suddenly to be re-ignited a little further. Suddenly, the craft went down towards the ground and disappeared from our sight, as if it had landed. At the same time, at the spot of the supposed landing, an hemispherical reddish reflection appeared, of orange color, of a diameter of maybe 15 meters approximately, as much as it is possible to judge some because of the distance. In the center, a long incandescent filament of about fifty meters rose, high in the sky. At the end of 20 to 30 seconds, all disappeared. Almost at once, the luminous ball was re-ignited above the horizon. This coule in no way have been an atmospheric phenomenon." "The night was dark, without Moon, with a half covered sky, and rather low clouds. However, when it was lit, the craft gave a luminosity much sharper than that of the moon. It goes without saying that this appearance produced on us a certain emotional shock, which can have made us make errors of appreciation as for the distance and the luminous intensity." "I had stopped our car at the entry of the small way which leads to Fonland. Little after having taken altitude again, the machine dove to us. It grew bigger quickly, while the light projected on the ground approached at a sharp pace. We became frightened. Whereas it was within approximately 200 meters of us, I started without more waiting and I went in direction of Fonland. My wife saw for one moment, through the trees of the forest of Villaines, the craft that followed us, parallel to the road. When we arrived at Fonland, the luminous craft was still there, although a little more distant. It fainted one minute after, and did not reappear." "Our adventure however did not stop there. Having resumed out trip to Saint-Eloi in Bourges, and having arrived at the height of the pond of the Racines, we saw another craft. It was appreciably further; perhaps at 4 or 5 kilometers, still in the direction of Jou. It was this time a kind of spindle of orange colour, not dazzling like the first. We could follow its trajectory during a few seconds, before its total disappearance. All this occurred without we hearing the least noise." The Patient family drives towards the hamlet "Fonland" to see family members. Sudden gleams appear in the sky. Then they observe an extremely shining object which evolves above the hamlet. It moves while wavering slightly, turns off, re-ignites suddenly. Suddenly it goes down towards the ground and disappears, according to the witnesses as if it had landed. Just at this time a reddish hemispherical reflection of a diameter of 15 meters approximately appears, under which there are incandescent wires. The observation proceeds during twenty to thirty second, then all disappears. At once the luminous ball re-ignited above the horizon. It then seems to follow the family and disappears definitively after the forest of Villaine. At their return close to the pond of Racines (thus on the community of Saint Doulchard) the family sees a spindle of orange colour which is not dazzling. They look at its trajectory until complete disappearance. During the entire observations, no noise was heard. Elsewhere, the two authors indicate that in Saint-Doulchard in the department of the Cher on September 23, 1954 at 09:00 p.m., there was an observation of a luminous object, and they give no other information. 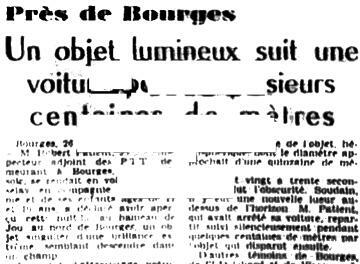 The Belgian ufologist indicates that in 1954, on September 23, in France, in Le Jou in the the north of Bourges, "Towards 21:00, Robert Patient, in company of his wife and his children saw a strange shining apparatus go down towards a field. At the point of supposed landing a reddish glow appeared. Gradually the witnesses saw it take the shape of a hemispherical machine about fifteen m of diameter. A kind of incandescent thread 50 m length was stretched above the cupola. Suddenly the object ceased irradiating this red gleam and during 20 to 30 seconds there was darkness. Just as suddenly it was re-ignited and took off. Robert Patient who had stopped the car, restarted and was followed on a hundred meters by this machine." The source is noted: "Jimmy GUIEU: 'Black-out sur les S.V.' - Fleuve Noir 1956 - p. 145, 146". Another version is given: "The Patient family was the witness of the landing of a shining object, emitting a light comparable with that of magnesium, a red light and a narrow luminous beam. It took off again a moment later and followed their car until they reach Fontland. In Plombières police officers and several isolated witnesses then observed the object which flew over the surroundings in an erratic manner during one hour". The sources are given as "Le Figaro, 27 September 1954; Paris-Presse, La Croix, 28 September 1954" with a thank to Wim van Utrecht. Eric Maillot, seeking cases of "green rays" in the 1954 French flap, indicates that [...] "Vallées talks about an _orange_ gleam in 'Chronique des apparitions ET p.282! Note this detail 'magnesium' is found in a case of the Nord again in Feyzin on 15/09/1954 and in that of 23/09/1954 between Jou and Fontland (Patient family) who speaks about 'flashes of magnesium'. One can see there an influence of the readings of the witnesses in the press." James Neff says that on September 23, 1954, in Le Jou, France, the Patient family witnessed the landing of "a bright object giving off a magnesiumlike ight, a red glow, and a narrow beam of light. It took off again a moment later and followed their car until they reached Fontland. Policemen in Plombieres and several independent witnesses observed the object as it flew erratically over the area for 60 min." 1954 - At 9:00 p.m. in Le Jou, France the Patient family witnessed the landing of a bright object that gave off a magnesium-like light, a red glow, and a narrow beam of light. It took off again a moment later and followed their car until they reached Fontland. Policemen in Plombieres and several other independent witnesses observed the object as it flew erratically over the area for 60 minutes. (Sources: Aime Michel, Flying Saucers and the Straight Line Mystery, p. 69; Jacques Vallee, Passport to Magonia: A Century of Landings, p. 210). 21:00 Close to a place named Le Jou, in the north of Bourges, the Patient family sees a brilliant object emitting a light similar to that of magnesium. When it is on the ground, it emits a red gleam and a narrow beam of light. One moment later, it flies away again, becomes shining again, moves towards the witnesses and follows their car until they reach the village of Fontland. Independent observations are made by the police force of Plombières and several other people. The object flies in an erratic manner during 1 h.
The sources are noted as Le Figaro, September 27, 1954; Paris-Presse; La Croix, September 28, 1954; Vallée, J., case #15, "Rapport sur l'analyse de 200 observations documentées faites en 1954". Luc Chastan indicates in his database that in the Cher in Vasselay on September 23, 1954 "A family drives towards the hamlet 'fonland' to visit relatives. Sudden gleams appear in the sky, Then they observe an object extremely brilliant which moves above the hamlet. It moves while wavering slightly, turn off, is re-ignited suddeny. Suddenly the latter goes down towards the ground and dissapears according to the witnesses as if it had landed. Just at this time a reddish hemispherical reflection of a diameter of 15 meters approximately appears under which incandescent threads come out. The observation proceeds during twenty to thirty second, then all disappears. At once the luminous ball is re-ignited above the horizon. It seems to follow the family then after the forest of Villaine dissapears definitively. At the return close to the pond of Racines (thus on the nearby commnunity of Saint Doulchard Saint) the family Sees a spindle of orange colour not dazzling. They follow its trajectory with the eyes until complete disappearance. For the whole of the observations no noise was heard." The website indicates that on 22 September 1954 at night in Bourges, France "An object was sighted that had an appearance and performance beyond the capability of known earthly aircraft. One object was observed by one male witness for 30 seconds (Robert)." The source is indicated as Guieu, Jimmy, Flying Saucers Come from Another World, Citadel, New York, 1956. The website indicates that on 23 September 1954 at 21:00 in Le Jou, France, "The Patient family witnessed the landing of a bright object giving off a magnesium like light, a red glow, and a narrow beam of light. Explanation: Re-entry." And: "At 9:00 p.m. in Le Jou, France the Patient family witnessed the landing of a bright object that gave off a magnesium-like light, a red glow, and a narrow beam of light. It took off again a moment later and followed their car until they reached Fontland. Policemen in Plombieres and several other independent witnesses observed the object as it flew erratically over the area for 60 minutes." And: "The Patient family witnessed the landing of a bright object giving off a magnesium like light, a red glow, and a narrow beam of light. It took off again a moment later and followed their car until they reached Fontland. Policemen in Plombieres and several independent witnesses observed the object as it flew erratically over the area for 60 minutes." And: "An object was observed from a car. Multiple independent witnesses." And: "One red delta-shaped object, about 20 feet across, was observed by four witnesses on a farm for over 60 minutes (Patient)." The source is indicated as Vallee Magonia Database. *Sep. 23, 1954 - At 9:00 p.m. in Le Jou, France the Patient family witnessed the landing of a bright object that gave off a magnesium-like light, a red glow, and a narrow beam of light. It took off again a moment later and followed their car until they reached Fontland. Policemen in Plombieres and several other independent witnesses observed the object as it flew erratically over the area for 60 minutes. (Sources: Aime Michel, Flying Saucers and the Straight Line Mystery, p. 69; Jacques Vallee, Passport to Magonia: A Century of Landings, p. 210). Summary: The Patient family witnessed the landing of a bright object giving off a magnesium like light, a red glow, and a narrow beam of light. It took off again a moment later and followed their car until they reached Fontland. Policemen in Plombieres and several independent witnesses observed the object as it flew erratically over the area for 60 min. Vallée cumulates different sightings in one event. For Plombière, see the separate file for the same day, be aware that other sources indicate the Plombière sighting duration as 10 minutes not one hour. [---] Article in the national newspaper Le Figaro, Paris, France, September 27, 1954. [---] Article in the national newspaper Paris-Presse, Paris, France, September 28, 1954. [vm1] Article in the regional newspaper Var-Matin République, Toulon, France, September 28, 1954. [---] Article in the regional newspaper Le Bien Public, Dijon, France, September 28, 1954. [---] Article in the national newspaper La Croix, Paris, France, September 28, 1954. [qh1] Article in the regional newspaper Le Quotidien de la Haute-Loire, France, September 29, 1954. [am1] "Mystérieux Objets Célestes", book by Aimé Michel, Seghers publisher, France, pp 96-97 and 98, 1958. [jg1] "Black-Out sur les Soucoupes Volantes", book by Jimmy Guieu, Fleuve Noir publisher, France, pp 145-146, 1956. [jg1] "Flying Saucers Come from Another World", book by Jimmy Guieu, English version of "Black-out Sur Les Soucoupes Volantes", Citadel Press publishers, USA, 1956. [mc1] "Les Apparitions de Martiens", book by Michel Carrouges, (aka Louis Couturier), Fayard publisher, France, page 78, 1963. [jg1] "Black-Out Sur Les Soucoupes Volantes", book by Jimmy Guieu, Omnium Littéraire publisher, France, pp 145-146, 1972. [gl1] "Face aux Extra-Terrestres", book by Charles Garreau and Raymond Lavier, Delarge publisher, J'ai Lu, France, pp 144-145, 1975. 0.1 Patrick Gross April 6, 2007 First published. 1.0 Patrick Gross January 28, 2010 Conversion from HTML to XHTML Strict. First formal version. Additions [go1], [em1], [jn1], [jb1], [lc1], [ud2]. 1.1 Patrick Gross June 17, 2010 Addition [jv5]. 1.2 Patrick Gross November 15, 2014 Additions [ni1], [ta1]. 1.3 Patrick Gross November 22, 2016 Addition [ub1]. 1.4 Patrick Gross January 31, 2017 Addition [ub1].